James Morton decried the hostile comments on the book’s Amazon page. Former Great British Bake Off star James Morton has caused a row with locals on the Shetland island of Whalsay over his portrayal of fisherman in his latest cookbook. Mr Morton’s latest publication Shetland: Cooking on the Edge of the World, a joint venture with his broadcaster father Tom Morton, includes a poem on a page relating to the Bonnie Isle where fishermen are referred to as “unscrupulous baby seal bludgeoners”. The poem does not directly name Whalsay as the location in which these fishermen hail from, however, is included directly in the middle of the page relating to the lucrative fishing industry on the island. Mr Morton Jnr took to Twitter to address his concern over the comments and review section on websites selling his book after they were bombarded with one-star reviews, with one reviewer declaring the book “slander against a community”. He tweeted: “When my father writes about the vast wealth of a small community on Shetland, and they respond by anonymously slagging your book on Amazon. Petty. Whalsay is the centre of Shetland’s fishing industry. In 2012 skippers on the Isle had fines implemented running into the tens of thousands as a high profile fishing scam was brought through the courts. Skippers were found to be under-reporting their catches of mackerel and herring in order to not breach EU quotas in an event that was labelled as the Black Fish Scandal. The total value of all illegal fish landed in Shetland was calculated to total £47.5 million. Within the book, the father and son duo also take a jibe at the Whalsay accent, describing it as “incomprehensible”. Councillor Duncan Simpson, who hails from Whalsay, said: “Nobody is overly bothered about the comments relating to the accent, we are used to that. “It is the insinuation of the fishing industry that has really angered people. “I am disappointed to see such negative stereotypes appear in a cookbook about Shetland. People think it is painting the industry and the community in a really negative light and dragging up old stories that are probably better left in the past. “There have been a lot of negative comments and reviews on sites like Amazon and I don’t condone that behaviour. We all have the right to be angry but there is no need to stoop to that level with online abuse. 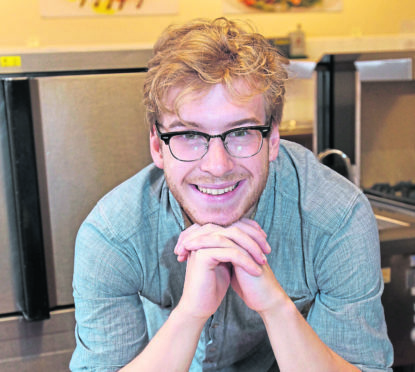 James Morton appeared on the third series of the Great British Bake Off in 2012, which at the time still aired on the BBC. The Shetlander, who was studying medicine at the University of Glasgow, was encouraged to apply to the show by friends. In the final, aired to an audience estimated at six million people, Mr Morton faced stern opposition from fellow contestants Brendan Lynch and John Whaite. Mr Whaite would go on to scoop the illustrious title of master baker after the three competitors were instructed to create a puff pastry pie, called a pithivier, fondant fancies and chiffon sponges. Mr Morton amassed a cult following, in part due to his collection of woolly jumpers. In an interview with the BBC following the conclusion of the show, Mr Morton was asked if he would continue to pursue a career as a doctor or if his attention had been diverted to delving into a career in baking.